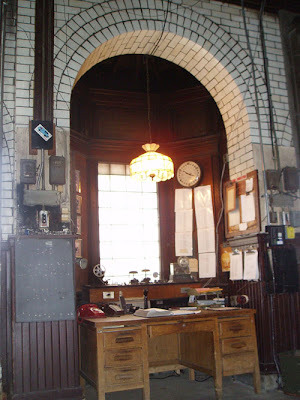 In the first post in this series, I shared a few scenes that were reasonably familiar - the Terminal Tower, the Arcade, and Public Auditorium. This photo is the last one that will contain many obviously recognizable buildings. 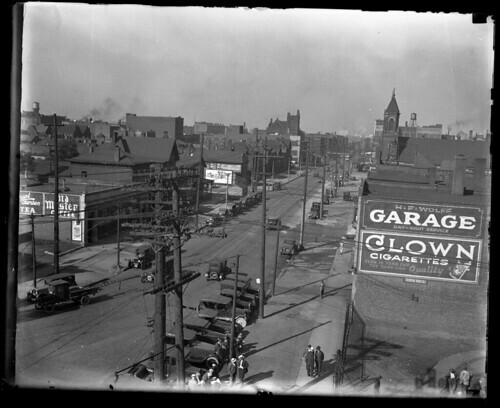 The scene shown here is of the intersection of Carnegie Avenue (then Central Avenue) and East 14th Street. The camera is pointed to the northwest. To the left is St. Anthony of Padua Roman Catholic Church, still standing. Next to it, the May Company garage. Behind them, one can see a bit of green space - Erie Street Cemetery. Behind this row of buildings sits Brownwell Junior High School, also still standing. On the same block, we can also see H.F. Wolff's garage. In the foreground, there is a Rex gas station. On another corner, there is a tailor, print shop, and restaurant. On East 14th Street, on the far left, is a building that for some reason continues to catch my eye, perhaps because of elements that seem almost Art Nouveau. This photo shows the view west on Carnegie Avenue from East 14th Street. The sign of H.F. Wolff Garage can be seen on the right. We can also see the spires of St. Anthony of Padua. Other than that, just about all of the buildings shown here - both houses and commercial establishments - are now gone. There are so many questions. What is the building in the distance, in the center, that looks like a church? And what enterprise was served by the distant water tower? 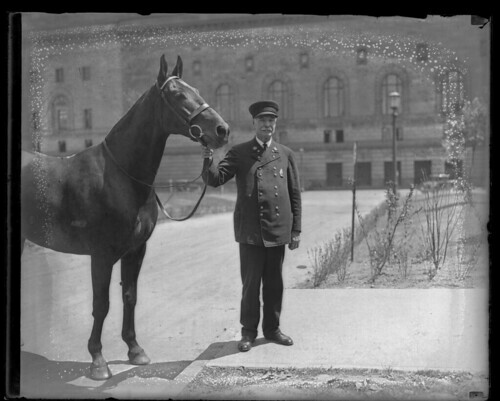 These photographs help to serve as a historical record of this bit of lost Cleveland. In the next group of photographs, I'll explore more of this now-lost section of Carnegie Avenue. When I drove by the Day-Glo building, at East 45th and St. Clair Avenue this past winter, I started thinking about a post for this blog. The glowing letters of their sign jumped out of the gray, dreary background that is so much a part of the Cleveland winter. I was sure that there had to be a story there. I never quite got around to doing the research, though. As you may know, I'm a children's librarian. I've looked and looked, and there simply aren't any good childrens books dealing with Cleveland area. A colleague suggested I look at The Day-Glo Brothers: The True Story of Bob and Joe Switzer's Bright Ideas and Brand-New Colors, written by Chris Barton and illustrated by Tony Persiani. She thought it was interesting just as a quality work of non-fiction. I knew that there was some sort of local connection, and I wanted to see what it was. The book tells the story of two brothers, growing up in Montana, and their ambitions. The story begins in black and white, and progresses to a wild spectrum of Day-Glo greens, yellows, and oranges. Barton tells the story of how the brothers moved to Cleveland, to be closer to their markets, which at the time were limited by the fact that their inks only glowed under artificial light. Here, in 1938, they discovered how to make paints that glowed in daylight. We learn about their pursuits, initially medicine and magic, and how, together, they created the company that became known as Day-Glo. Finally, we learn about how these colors work and the many ways that they are used. Chris Barton does an excellent job of telling the story. Tony Persiani's illustrations are stellar, fully utilizing Day-Glo colors to illustrate the story in an utterly compelling manner. This approach to illustrating science and invention definitely raises the bar. Initially, I was displeased with the lack of "Cleveland" in the book. The first 20 pages provide background, dealing with Joseph and Robert Switzer's childhood and lives as young adults. Once they move to Cleveland, the story is more about their inventive process and the various uses of these new paints than it is about their lives in and impact on Cleveland. Then I remembered that this was a book for children, not an academic paper. I was wrong. The backstory and numerous illustrative examples are absolutely crucial for the manner in which the story is told. It's called character development. The last two pages of the book, the author's note, provided the biggest surprise for me. On them, Chris Barton describes his research process. I read this eagerly, curious as to what sources he'd been able to locate that had eluded me. I was shocked to find that the book was almost entirely original research. Barton talked to Joseph and Robert Switzer's family members and colleagues. He consulted their original letters and notes. He put the story together. This is unusual at best. Non-fiction for children tends to be the same stories, rehashed again and again, relying exclusively on secondary materials. Among those that are well done, it can be difficult to find ones that are visually compelling. This should be taken as a lesson as to what children's non-fiction should be. I recommend it highly both as a librarian and local historian. A little while ago, Zack Miklowski, a firefighter with an interest in historic preservation, brought the case of Fire Station 26 to my attention. He had a great collection of photos, both historic and contemporary, to illustrate the story. He has the background to tell this story better than I can. I asked him to write a guest post on the subject, which he graciously agreed to do. 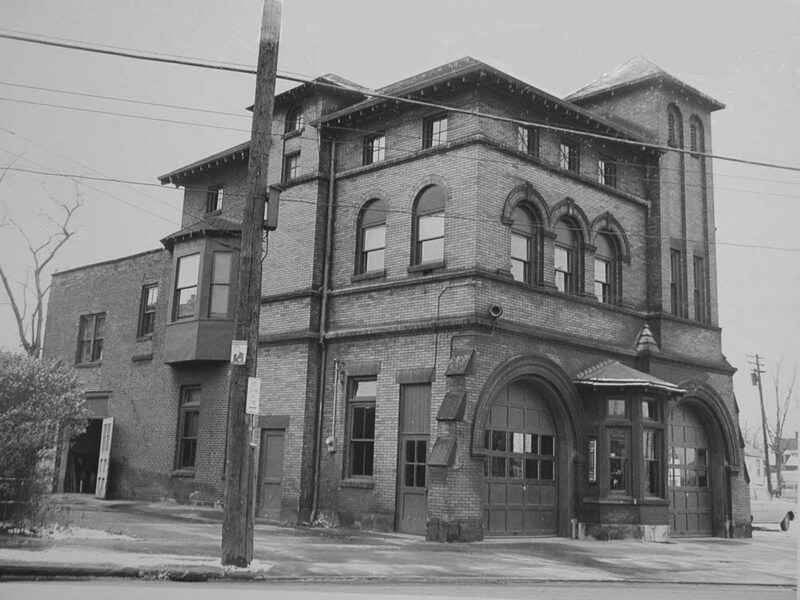 The city of Cleveland plans to replace an old historical firehouse in 2012. The City of Cleveland 2008 Capital improvement plan, page 30 states that Fire Station 26 is to be replaced in 2012 at a cost of $3,650,000. 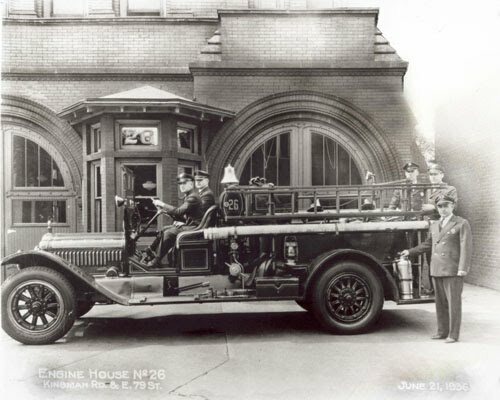 This historic structure deserves to be a historic landmark and remain a Firehouse. 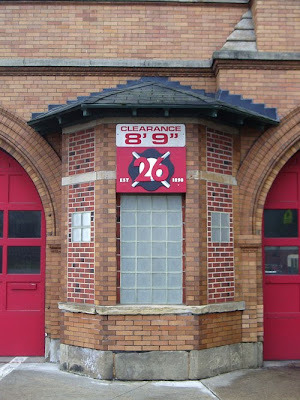 Station 26 was established May 1st 1898 at 7818 Kinsman, corner of East 79th Street (then East Madison Avenue) The station was built by the Kinsman Street Improvement Association for the surrounding Hungarian neighborhood. 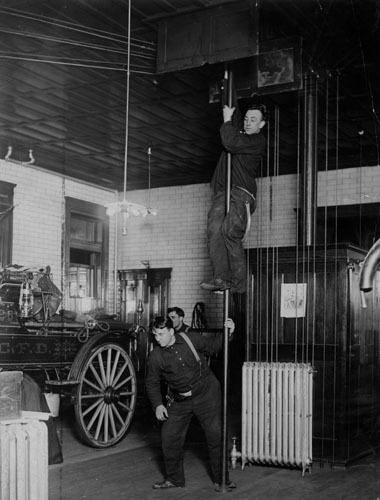 The City of Cleveland agreed to provide firefighters, and apparatus to man the station after the community had it built. 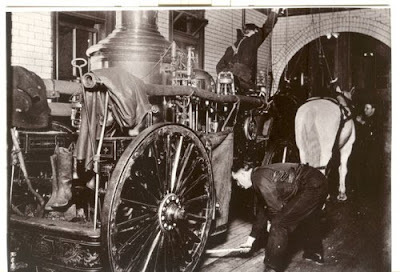 It was a state of the art facility for its time. The 1897 History of the Cleveland Fire Department states "Work has commenced on the new Kinsman Street Fire Station, Which, when finished will be one of the most complete and modern buildings in the city." 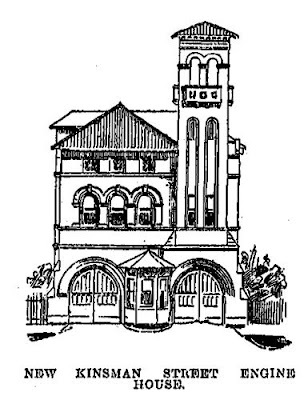 The Plain Dealer, Wednesday March 9th, 1898 reported, "The new station is an exceptionally fine structure of its kind, built of brick, with stone trimmings, with two stories and a large attic and a tower of particularly artistic design." It was built with glazed yellow bricks with contrasting stone in a Middle Victorian Stone Style. The Station has two arched bay doors, for the steamer and for the hose cart. This is an improvement on single bay door design where two apparatus use the same door. The steamer was a coal fired pump. The hose cart would follow with all the hose needed to fight fires. 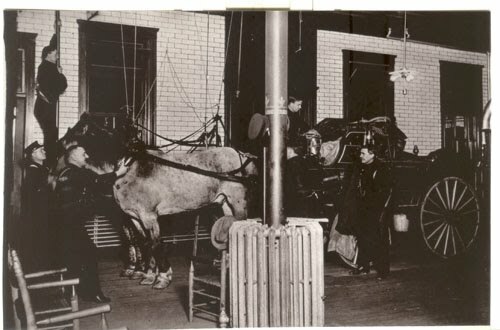 In 1898 both apparatus were horse drawn. In the rear of the station was the stable with a hayloft above. This hayloft has been used for many things since 1898. It was a locker room, the original firefighters credit union, and now a kitchen. 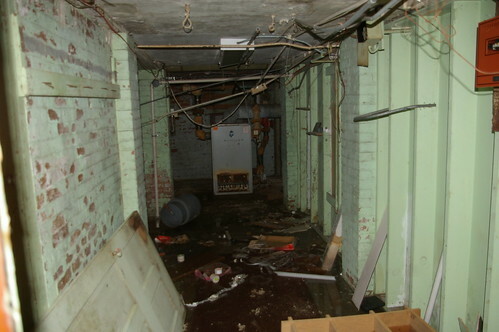 The second floor of the station has the bathroom, officer room, and dormitory. The Original Georgia pine woodwork and wainscoting is intact. 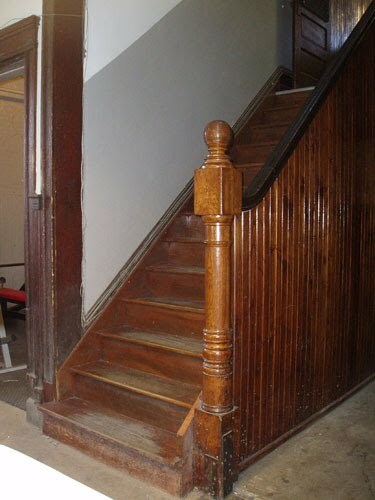 The original wood stairway is intact. 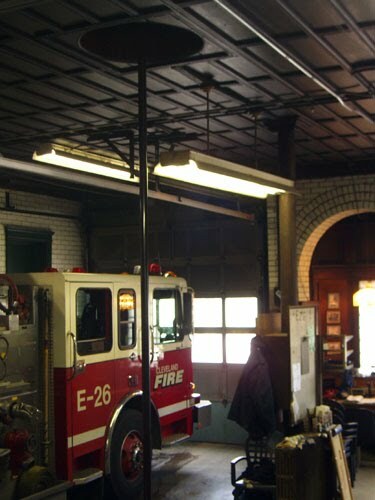 The Dormitory has a fire pole that leads to the center of the station, which was between the two apparatus. The apparatus bay has a cherry wood ceiling and traditional white enamel brick walls. Gaslights hung from the ceiling in 1898. Originally there was a circular radiator, which was a impromptu meeting place to warm up after cold weather fires. In the front center of the bay is the watch desk. 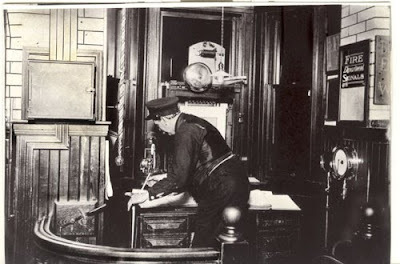 The original game well telegraph system is still there with cherry woodwork surrounding. 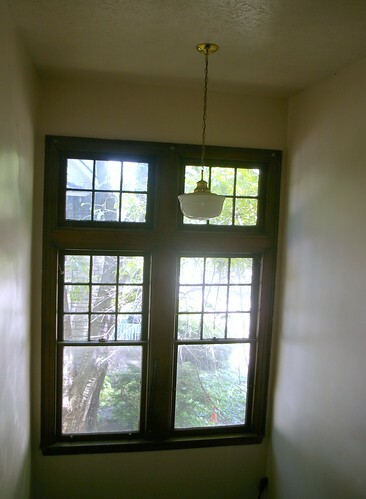 The original windows have been bricked over and the banisters that surrounded it have been removed. In the original plans a 3-story watchtower was to be built. This tower would have had a firefighter lookout to watch for smoke. This tower was abandoned due to the telegraph system. A illustration of how it may have looked has been included. From the Cleveland Plain Dealer, Wednesday, March 9th, 1898. In the attic the original hole for a Fire pole from the 3rd floor to the 2nd floor was found and covered up. This is the oldest continuously open fire station in the city of Cleveland. (Photo 21,22). 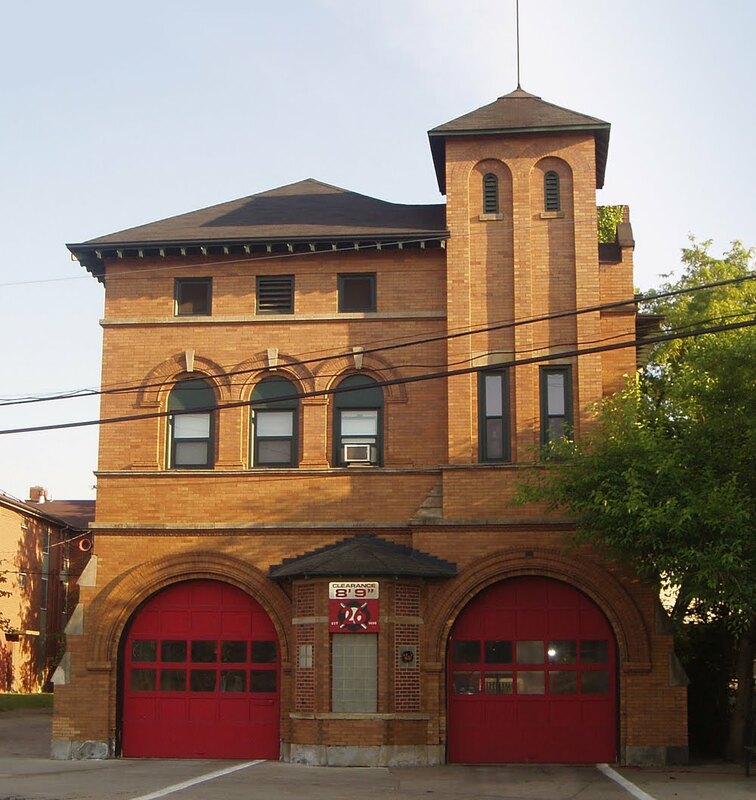 Although this station is no longer a modern building as stated in the History of the Cleveland Fire Department, this station is in good shape after 112 years. This Fire Home should be saved, and not lost. If the city replaces it will most likely be left to rot away like so many other historic structures. The case of the Brainard residence brougth to my attention that I need to do something to address the buildings that I simply haven't been able to learn much about. Some of these are historic building for which my research has just been fruitless - in the past, I've refrained from posting about them, because I know you want good content, not just "This is an interesting building, but, um, I couldn't find anything about it in my various research sources." Others, I simply haven't had time to look into, and may deal with in depth in the future. 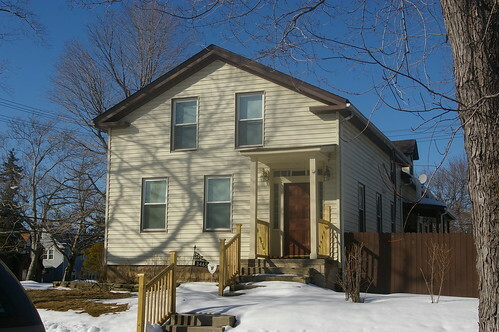 This large house appears to have been built in the middle third of the 19th century. I can't be much more sure about a date than that. It is part of Wildwood Park, which is part of Cleveland Lakfront State Park. I'm unclear as to whether it is owned by the city or state. Given the size, it has the appearance of having been a tavern or inn, but other than proportions, I have no justification for this claim. A house was present on this site in 1858, belonging to one P. Banhard or P. Bankard, but I do not know for sure that this structure was the house in question. 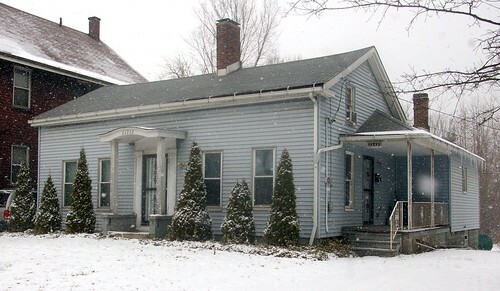 This nicely proportioned Greek Revival style farmhouse sits at the corner of Taylor and Silsby. One might miss it while driving by, because it faces Silsby rather than Taylor. It retains the original sidelights and transom surrounding the front door. 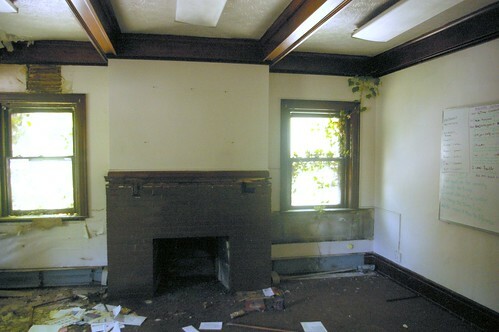 Update (August 10, 2010): This was the Frederick Silsby residence, as noted below by Kara Hamley O'Donnell. This house shares similar proportions to the Brainard residence and to 4216 East 93rd Street. If I had to guess, I'd say it was built circa 1850. 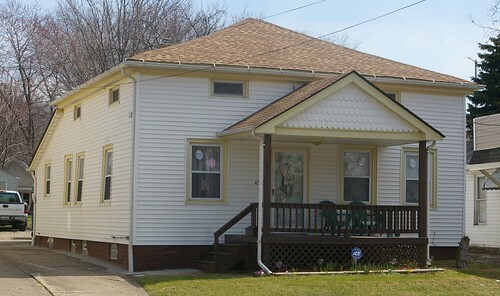 This brick house has had a storefront added to it, which is cropped out in this picture. The more shallow pitch of the roof make me think the date might be closer to 1840 than 1850, but it could be a bit later than that, too. 11715 Miles Avenue, Cleveland, Ohio. Finally, this little house on Miles is surely worthy of more research. It's thought by some to be quite old - perhaps as early as 1830, though I'm not sure I want to be quite that optimistic. It will surely make for a good narrative at some future date. Back in December, I detailed the cause of this Second Empire style house at 706 Lakeview Road, in the Glenville neighborhood of Cleveland. It featured a nice, deep lot, with plenty of space. It was located one house over from the Schellentrager residence, one of the great Victorian houses in this city. 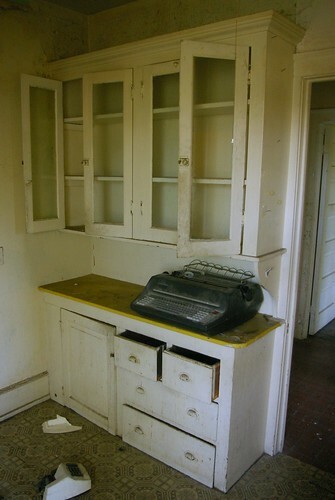 Further, it was a small house - it could be rehabbed without the insane effort some larger places might have required. Yesteday, I drove down Lakeview, and saw only an empty lot where once this house had stood. 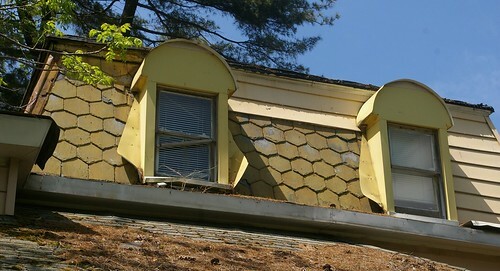 The details, such as these dormers, are now lost forever. I do have a few photographs of it, but these are no substitute for the building itself. How many more examples of our architectural heritage do we have to lose before we're to take action? 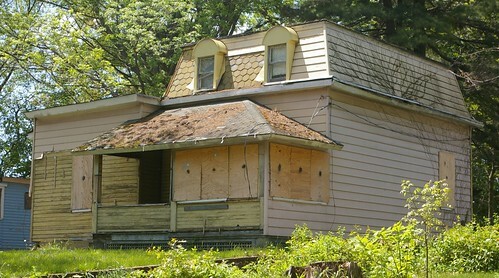 We can't simply wait around for others to fix up these houses. There are enough people among us with the skills and the energy to make a difference - what are we waiting for? 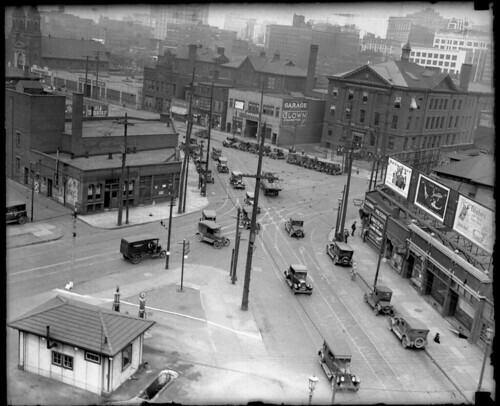 I recently obtained ten 4x5 glass plate negatives of Cleveland, taken in about 1927. They appealed to me because they were personal photographs, so they weren't the same images that I've seen reproduced many times before. Some were of areas that I haven't really seen photos of. Further, the large size of the negatives means that they contain a heck of a lot of information. This includes street signs, billboards, and signs in store windows. I want to thank Bill Barrow, Special Collections Librarian at Cleveland State University and the fine folks in the Digital Production Unit for helping me to identify the locations in these images and getting them digitized. The negatives were scanned at 1200 DPI, which brought out almost all of the information they had. I strongly encourage you to click through full-resolution versions of the files on Flickr, to see all the detail. 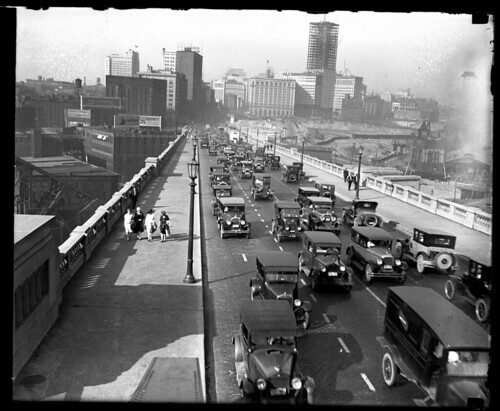 This image, taken on the Detroit-Superior (Veterans Memorial) Bridge shows the Terminal Tower under construction. The bridge to support the train tracks going into the terminal can be seen to the right, under construction. One can also see the Baltimore and Ohio railroad terminal, to the far right, at a time before it had lost its mansard roof. There are many signs identifying businesses as well as billboards. It's interesting to note that the photographer appears to have climbed up on the steel arch of the bridge to take this photograph. 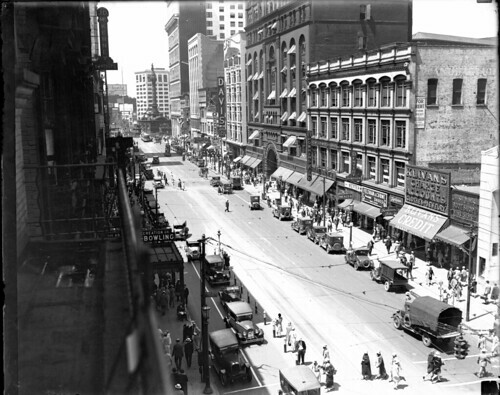 This photo shows Euclid Avenue, looking west toward Public Square. The Soldiers and Sailors Monuement can be seen in the distance. The Loews Mall theater was showing Rod La Rocque in Resurrection, allowing us to date the image to 1927, the year that film was released. All sorts of other illuminated signs line the street, including those for clothiers and dentists. Finally, I offer you a mounted firefighter and his horse. They are photographed in front of Public Auditorium. 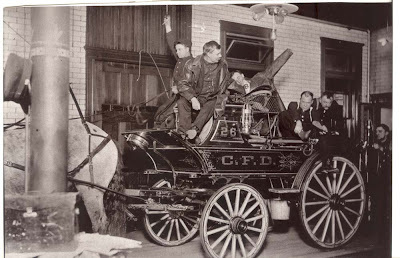 This was about the time when the fire department became fully mechanized, so this may well have been the last horse in their service. Check in for our next post, where we look into a few more of these photographs. I've been meaning to write about the Brainard residence for some time. 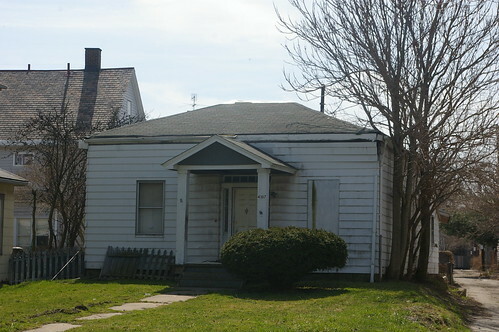 It's a small house, built circa 1830-1850, located at 4107 Denison Avenue, in Cleveland, Ohio. I just haven't had the time to research it among the many other projects that I've been working on. I just learned that the house is going to be demolished soon. It is one of very few surviving houses of this age and style left in the city. It was similar, in some ways to the Leonard Case residence and the H. Mould residence, both documented by the Historic American Buildings Survey and both now lost. Many of the architectural details have been hidden by time and remodeling. The sidelights and transom surrounding the front door retain some obvious detail. 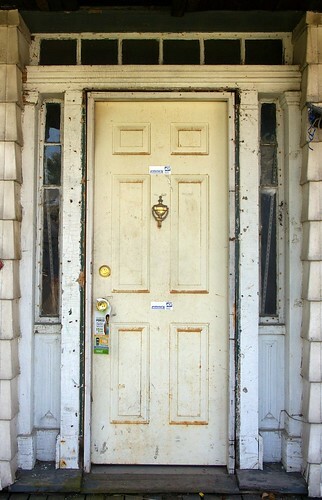 It is similar in style to the front door of the Isaac Warren residence. It does retain a few interior details, like the closet door and trim seen here. It's a small house. While it does require some major work, it's on a scale that's small enough that it could have been fixed. It's not like one of the mansions in Wade Park or East Cleveland that could easily become epic, insurmountable challenges. Why hasn't it been saved? Because no one has stepped forward to say that they're willing to accept this challenge. People don't want to live next to falling down houses. They make a considerable amount of noise about it. It should come to no one's surprise that they are the people whose voices are heard, not the outsiders ranting about the historical importance of this or that structure. 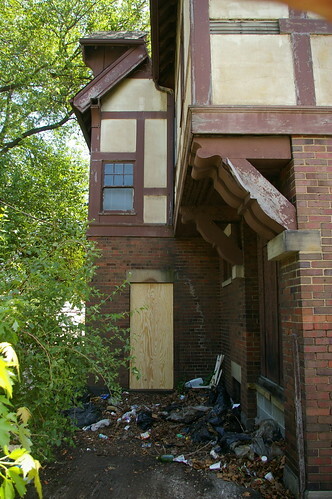 This house falls in Ward 15, which is served on the Cleveland City Council by Matt Zone. If this bothers you, I suggest contacting him to share your feelings on the matter. 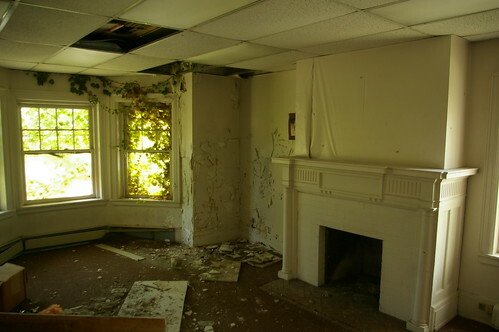 I'm not saying that we have to be the people to claim interest in these properties and rehabilitate them. If we aren't going to do that, however, we have to find people who will. In addition to all the buildings I've written about here, there are plenty of interesting structures that I just haven't been able to learn much about. In future posts, I'll be highlighting them, so that at least they have some public recognition, before they become threatened. 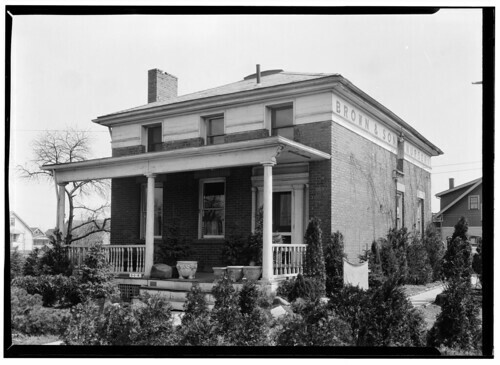 I was browsing through the photographs and documentation for Cuyahoga County from the Historic American Buildings Survey (HABS), the make-work project created in 1933 as part of the New Deal to record our country's most important historic structures. Three houses in Lakewood are included in this documentation. 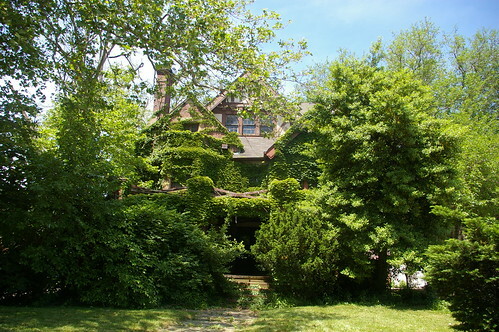 Two of them, the Nicholson House and the John Honam House (more often known simply as the Old Stone House) are still standing and are familar Lakewood landmarks. The third, however, I did not recognize. According to the HABS documentation, the Warren House was located in Lakewood at the intersection of Warren and Fisher Roads. There is no Fisher Road in Lakewood at the present. A Fischer Road exists, running east-west, south of Interstate 90, but it does not intersect with Warren Road. If it was continued east, the point where it would intersect with Warren would be in Cleveland, not Lakewood. 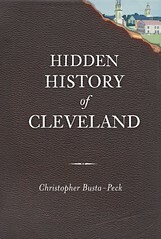 The 1914 Plat Book of Cuyahoga County provided the answer. 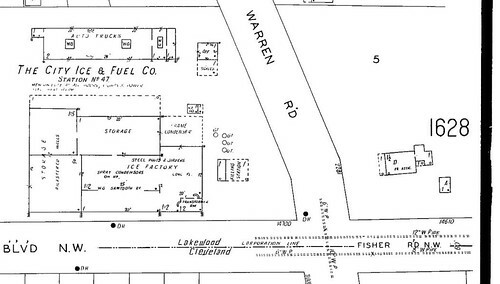 The map in question shows that the road now known as Lakewood Heights Boulevard was then known as Fisher. 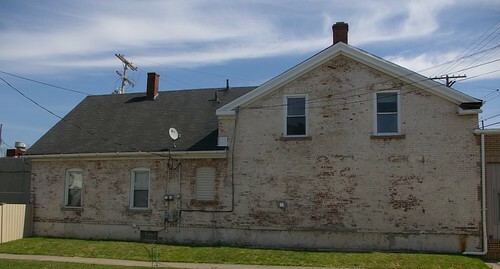 Further, it shows a brick, 1 1/2 story house on the northeast corner of the intersection, consistent with the Warren House. This 1929 Sanborn Fire Insurance Map confirms that the building on the northeast corner of the intersection is, beyond a reasonable doubt, the Warren House. 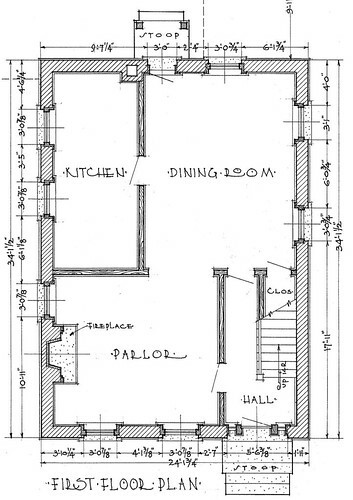 The outline of the house, which is very distinctive, matches exactly the outline given in the first drawing of the house in the HABS documentation. I wanted to know more about the house and its inhabitants. I contacted Mazie Adams, director of the Lakewood Historical Society, who provided valuable research, including many sources that I would not have otherwise been able to check. I really appreciate her help on this project. I haven't been able to learn much about the house or its inhabitants. While many sources that deal with Lakewood history recognize its importance, they are either unable to provide much information, or they provide information that doesn't check out. In this post, I'll try to illustrate what we do know. I find it to be more likely that he settled here in 1824, the year that Warren Road was put through, following an old Indian trail, between Detroit Avenue and Lorain Avenue. (Early Days of Lakewood, page 69) I base this on his purchase of land from Garrit and Sarah Smith, of Watertown, Connecticut, in that year. (AFN: 182406250001) It is unclear whether Isaac Warren chose to settle here because of the road or if the road was built because of his interests. Isaac Warren was from Waterbury, Connecticut. (AFN: 182406250001) He was married to Amelia Bronson, of New Bedford, Connecticut. They came overland from New Bedford, Connecticut. Mrs. Warren was Amelia Bronsen [Bronson] before her marriage, and had a great local reputation as an expert spinner of wool and weaver of homespun, which was the only cloth obtainable in those days. It was in fact "all wool and a yard wide". Mrs. Warren was born in Connecticut in 1799. Isaac Warren was a descendant of Dr. Joseph Warren of Boston who was killed in the Revolutionary War at the battle of Bunker Hill. Isaac Warren was a prominent citizen of the pioneer days and one of the biggest land owners, having several hundred acres. Mrs. Phelps is his only descendant living in Lakewood now. She lives on Clifton Boulevard with her daughter. Her son is married. There were seven children born to the Warren Family; Sabra and Rebecca, daughters; John, Lucius, Abraham, Isaac and Sherman, sons. Lucius, Abraham and Isaac moved to Iowa and became large property owners. Sherman Warren settled in Missouri. Sabra married, Silas Gleason, son of pioneer Jeremiah Gleason, and Rebecca became the wife of John Johnson. The only daughter of Rebecca, who for many years was regarded as mentally unbalanced due to a siege of scarlet fever, fell heir to all the Warren acreage. She was finally judged sane and left her estate to the Warren family, after giving a large slice to a German housekeeper who had cared for her in her last days. There's a problem with this account, which is repeated in the other sources - that Isaac Warren was the son of Dr. Joseph Warren, who died in the Battle of Bunker Hill. The 1860 Census records Isaac Warren's birth in 1782, seven years after the Battle of Bunker Hill. Even if we discount the Census record, it is unlikely, though not impossible, that Warren would have married someone half his age. Joseph Warren could not have been Isaac's father. I suspect that either Isaac's father was another individual named "Joseph Warren" or that Dr. Joseph Warren was some other familial relation. The remainder of the major facts from Mrs. Townsend's Scrap Book are consistent with the other sources on the Warren family. Townsend goes into more detail than the others, and, unfortunately, didn't provide any footnotes as to the sources of her information. Little other information exists about Isaac Warren and his family. The 1830, 1840, 1850, and 1860 U.S. Censuses place him in Rockport Township. He is listed as the property owner for part of the land (though not the site of this house) on the 1852 Blackmore and 1858 Hopkins maps. After that, I can find no record of him. There isn't any mention of his death in the Plain Dealer, nor in the Cleveland Necrology File. I've been unable to locate any property transfers that might suggest the dispersal of his estate or conveyance to his heirs. We can be reasonably sure that it was before 1874 - the Atlas of Cuyahoga County, Ohio published that year shows his land having been split up to various parties. Who was Isaac Warren? He was a reasonably well-off farmer. This is suggested by his land holdings and his house. He owned, at one point, at least 140 acres. 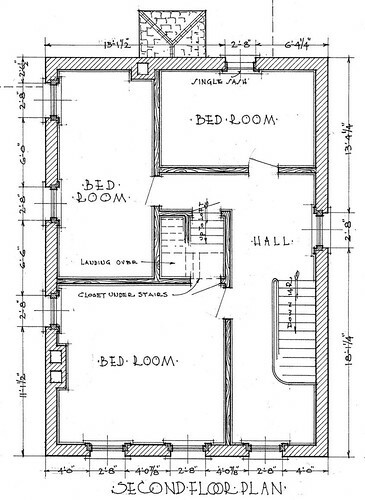 The Historic American Buildings Survey (HABS), in addition to the photograph above, provided detailed architectural drawings of the house. These include exterior views, details of mouldings and the front door, and floorplans for the first and second floors. The window sills were made of cement. The lintels were stone. The sloping part of the roof was slate, while the (nearly) flat part was tin. The HABS chose to document the house because it was one of the oldest houses in Lakewood. They estimate the date of construction as 1835, though they note "Local historians and early owners are unable to shed much light on who the original owners and builders are." A similar assessment of the date is made in Early History of Lakewood (page 77-78). 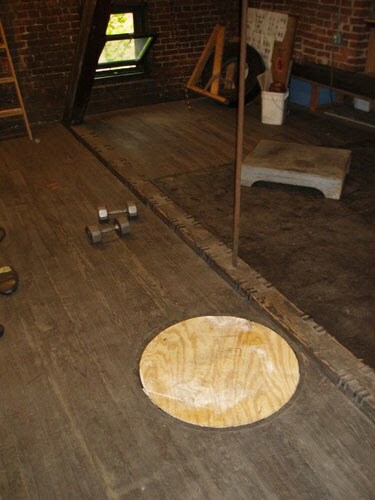 The Survey's notes state that the walls were 13 inches thick, consistent with this date rather than a more recent one. The front door is of a similar form, though more ornate than the front door of the Brainard residence, thought to have been built at about the same time. 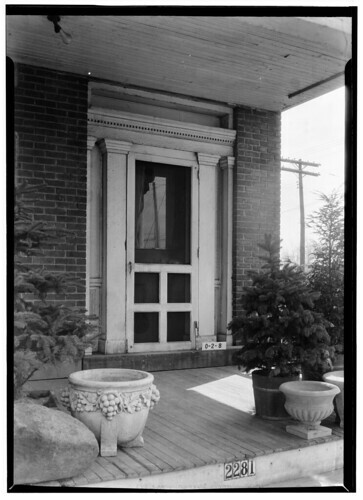 By the time of this 1936 photograph by Carl Waite for the Historic American Buildings Survey, the sidelights and transom surrounding the front door of the Isaac Warren residence had been filled in. It is illustrated in detail in this rendering. 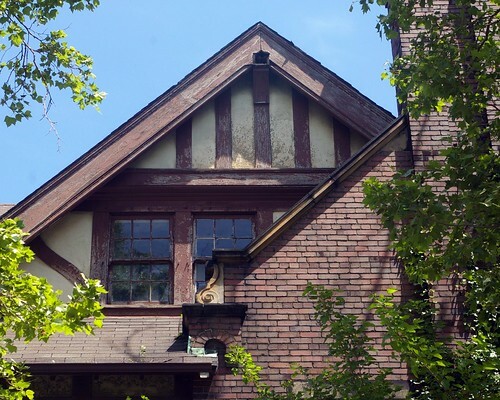 The documentation of this as a significant architectural further reinforces the significance of the detail of the Brainard house and the need to preserve it. Each floor of the Isaac Warren residence was about 700 square feet. The drawings, details of this one, done in 1936 by the HABS, help tell this family's story. 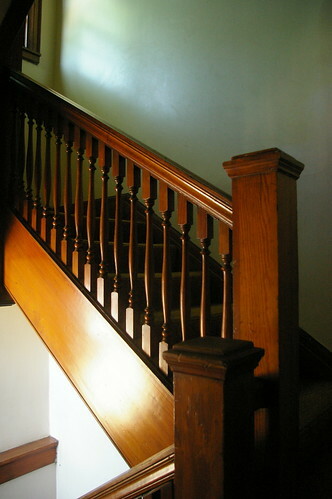 If you entered the house through the front door, you would be greeted by a hallway with a set of stairs going up to the second floor on the right. 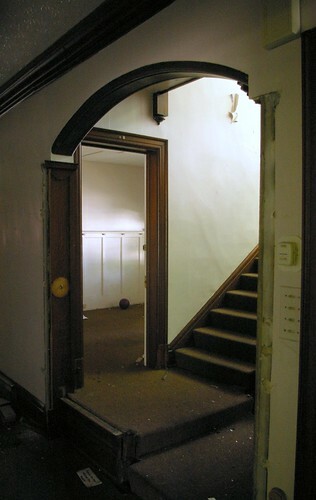 At the end of the hallway, a door led to the dining room. 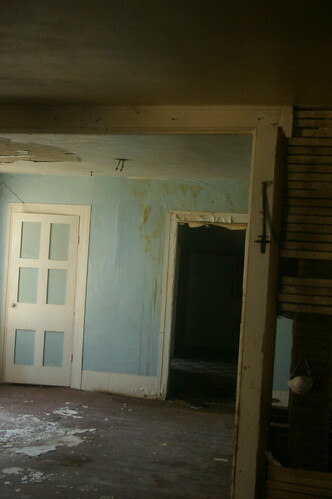 From this same vantage point, to the left, a door led into the parlor. The parlor, which measured about 13 x 15 feet, centered on a large fireplace, the primary source of heat in the house. 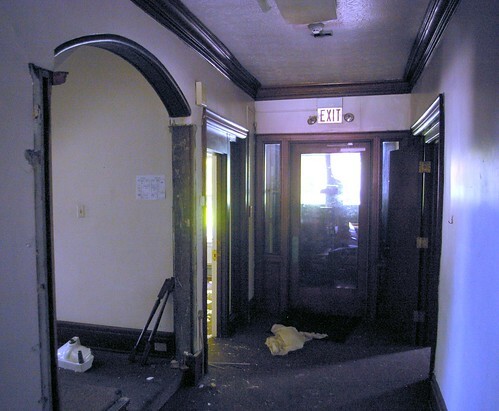 A large open doorway joined the parlor to the dining room. The dining room, about 14 x 16 feet, provided plenty of space for the Warren family and any guests or farm laborers. The kitchen was connected by a door to the dining room. Another door off the dining room led outside. The ceiling on the first floor was 8'8" high. The second floor had somewhat lower ceilings - 7'3" at the highest point. The stairs from the first floor led to a hallway with four doors. Three led to bedrooms. The fourth led to a winding staircase to a small loft. The loft would have been a rather cramped space - about 4' high at the highest point. The dimensions of the space with a ceiling this high were about 20' x 5'. One might assume that this was also used as a bedroom. The question remains as to when the house was built. It is shown on the 1858 Hopkins map, on a 44 acre parcel owned by J. Johnson. However, the map also illustrates a house on a larger parcel of land still owned by I. Warren. That house was located east of Warren Road, slightly south of where Westland Avenue now runs. We know that Isaac Warren built a house when he first moved to Rockport Township, and that this one was built later. Could the house owned by Isaac Warren in 1858 have been the first house he built here? Or, might Isaac Warren's 1858 house have been built even later? The 1830 Census shows 7 people in the Isaac Warren family. The 1840 Census shows 9. By 1850, the number was reduced to 3. I suspect that the house was built in about 1835, as has been suggested, as the family was growing and needed more space. Another reasonable possibility is that it was built in the 1840s. The site of the house and about 25 acres of land were transferred from Isaac Warren to his son, John B. Warren, in 1840. (AFN: 184003030002) John Warren does not appear in the 1840 Census, yet by 1850, it had grown to 7 members. The house might have been built by him for his family. In 1850, John and Ann Warren and four children (Catharine, Martha, Mary, and Lucy) were living in this house. Lucius Warren also lived with them. Isaac Warren lived until after 1860. (1860 U.S. Census) Amelia Warren, his wife, died sometime before 1850. (1850 U.S. Census) I've been unable to locate obituaries or burial records for them. John H. Johnson, a freshwater sailor born in New York, married Rebecca Warren sometime before 1850. 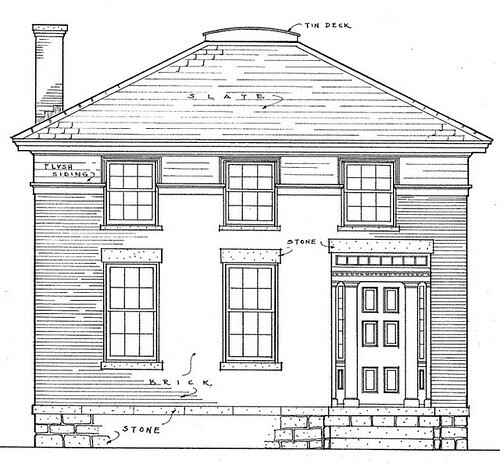 (HABS, 1850 U.S. Census) In 1853, he purchased this house and 44 acres of land, north and east of the intersection of Warren Road and Lakewood Heights Boulevard, from John B. Warren and Ann Eliza Warren. (AFN: 185304160001) This is illustrated in the 1858 Hopkins map of Cuyahoga County. He worked the land as a farmer. (1870 U.S. Census) John and Rebecca had one child, Henrietta, born circa 1860. Very little information exists regarding Johnson. He isn't mentioned in the chapter of Early Days of Lakewood titled "Late Pioneers, 1840-1865" nor in 1865-1889 chapter. The HABS documentation provides some notes as to John Johnson's family, according to oral history. "Mr. Johnson's folks resided on Johnson Street, also known as Water Street in Cleveland, Ohio. Mr. Johnson's cousin and Nettie Johnson, a Cob Girl, operated a sanituarium at Green Springs, Ohio. There is a Johnson Homestead at Green Springs." I haven't been able to put this information to any use. By 1874, their holdings appear to have increased to more than 60 acres, as shown on the Atlas of Cuyahoga County, Ohio. At least some of this increase was likely due to the dispersal of Isaac Warren's estate. It's worth noting that on this map, as well as maps published in 1892 1898, and 1903 Rebecca P. Johnson is listed as the owner of the property, not John H. Warren. In the 1898 atlas, their property is divided into two, a north part south half. The same is the case for the 1903 atlas - there are north and south parts. The land the house was on is in the northern part. Henrietta Johnson remained in the Isaac Warren residence for the rest of her life. (1880 and 1900 U.S. Census) In the early 20th century, the parcels of land around the house were gradually sold off. This is shown in this plate from the 1914 Plat Book of Cuyahoga County. It also illustrates that several outbuildings were present around the house, including two that were 1 1/2 stories high. Henrietta Johnson died in the Warren residence on October 6, 1917, at 6:45pm. 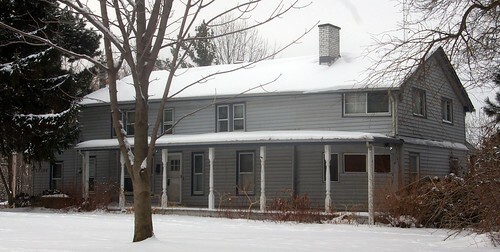 The address of the house was listed as 2281 Warren Road. The funeral was held at her late home on Tuesday, October 9, at 2pm. Henrietta was buried in Alger Cemetery. 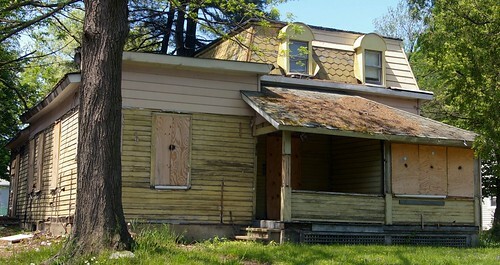 The status of the house after Henrietta Johnson's death is difficult to decipher. I haven't had any luck tracing the property transfers during the 1920s and early 1930s. This is due to the rapid split of the parcels in the area into residential lots and the transfer of the property among various entities due to foreclosure in the early 30s. Perhaps these fragments will be of use to some future researcher. Cadillac 7 pass tour. ; good tires and motor; will sacrifice for $250; sell quick; can be seen at 2281 Warren rd., Lkwd. Mr. and Mrs. Grover C. Weed, 1388 Brockley Avenue, Lakewood, announce the marriage of their daughter, Ruth, to Mr. Francis Chambers, son of Mr. and Mrs. Frank Chambers, 2281 Warren Road, Lakewood, which took place Dec. 5, 1931. Plain Dealer, October 10, 1932, page 33. We Carry Triple-X Soil-Bil-Der and all othre Stadler Fertilizers. Also the complete line of Nursery Stock. "Excepting, however, and reserving to the Grantor the brick house and wooden shed now on said premises (but not the land on which they are situated), together with the right to enter upon said premises and remove said house and shed at any time within thirty days from and after the date hereof; provided, however, that if said house and shed are not removed from said premises within said thirty day period, title thereto shall pass to and vest in the Grantee..."
This house feels familiar to me. I can't quite place it. This provision makes me wonder if it was moved, and I have, in fact, seen it somewhere else. 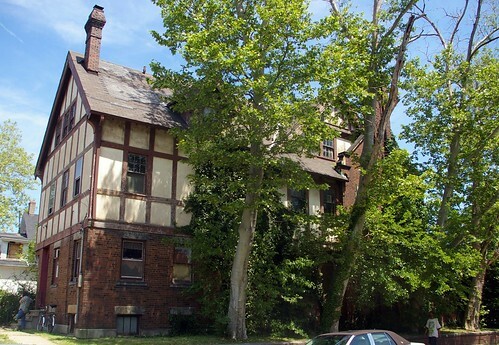 Mazie Adams, director of the Lakewood Historical Society, checked the permits at city hall, but was unable to locate either a demolition or moving permit for this address. Later in 1938, Field, Richards and Shepard, Inc. sold the property to the Standard Oil Company. (AFN: 193806040032) A gas station was built on the site soon after. The gas station, Meme's Sohio, at 2285 Warren Road, can be seen in this 1956 photograph, used courtesy of the Cleveland Memory Project. This wider view, also from 1956, provides a bit of a feel of the neighborhood at the time. The property has since become a rental car agency.